This is where Nathan and the girls lived while I was in the hospital for 10 days. The first evidence of God providing for us showed up just a few hours after I was admitted. Nathan had to hitch up the trailer, wake up the girls, and drive about 4 hrs to get to Phoenix from Kingman. Before he arrived, I asked my nurse if she knew where he could park the trailer for the day. 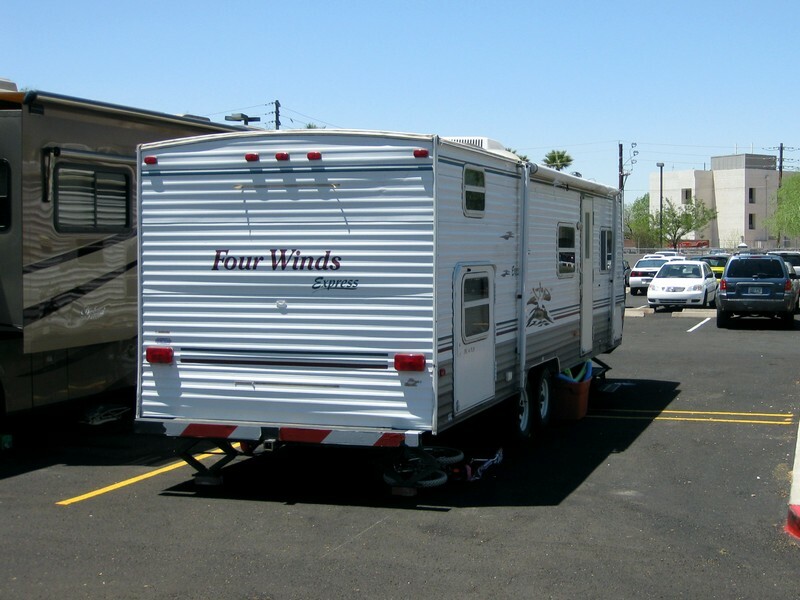 She said that the hospital (Banner Good Samaritan) had a few spaces for travel trailers, complete with hook-ups! She gave me the phone number for the security guard, and I called to ask if there were any open spaces. He said 4 out of the 5 were empty! I asked how long we could stay… as long as we needed. I asked how much it costs… it’s free. Full hook-ups! Water, electric, gas and sewage. I told him my husband would be arriving soon, hung up, and whispered a “thank you, God!” The first of many times we would see His hand on our situation. The girls were so good through the hospital days! I am not sure what I was expecting, but it definitely went better than I anticipated, where they were concerned. Even though I got to see them every day (sometimes only for a few minutes), I was very much not available for their every-day needs. Our hospital room was very small, so there wasn’t much room to play. Some days (like the one pictured above) they were happy to curl up on the bed with me, talk, and snuggle. I loved it! I just could not believe how badly I missed them the other 23 hrs of each day! I mentioned in another post about our friend Chelsey who flew out from CO just to help us take care of the girls. 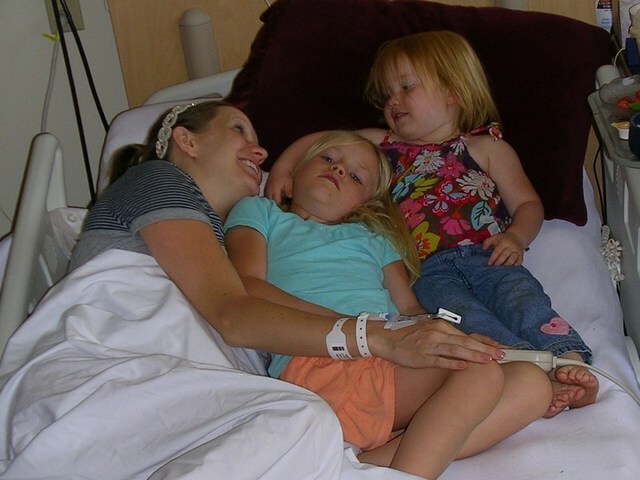 I shudder to think about how those hospital days (and nights) would have gone without Chelsey! I can’t even describe the relief that washed over me when I heard she was coming. She took wonderful care of our girls the entire week, then made the long drive back to CO with Nathan and the girls, and has spent several days since then helping us out. To say “what a blessing” seems like a gross understatement. But we thank God for Chelsey! A quiet moment with my precious man. I really could dedicate an entire blog post to my husband. He has been more than amazing through all of things we’ve experienced in the last 5 1/2 weeks. Chelsey snapped this shot one afternoon, and I am so glad she did. It’s a perfect example of how sweet Nathan has been through everything. While I would not wish pre-term labor or bedrest on anyone, I am thankful for how close we have grown through it. We escaped the hospital!! Actually I was just discharged to home bed-rest. My dad flew with me back to Colorado, and the girls drove with Nathan. The day after they arrived was Mother’s Day! We got to go to church together, and I spent the entire day loving on my sweet girls. Baby Will was an active participant in our day, kicking and punching and responding to his sisters voices. What a great gift this entire day was! This Mother’s Day was one of reflection for me. My first deep thought this-morning (don’t ask how long it took to have one of those after I’d woken up… it’s embarrassing) was about the last 2 weeks. What an incredible roller-coaster it’s been! It struck me how very different this Mother’s Day *could* have been. Just 10 days ago, doctors and nurses were attempting to prepare me for what they thought was inevitable… giving birth to a micro-preemie. He would most likely not survive. Yesterday would have felt much different, if God had allowed that. My heart is overwhelmed with gratitude for God’s merciful hand on our situation. For sparing the life of my son. For working numerous miracles that have already touched people we don’t even know. But my heart also hurts today. For the friend who, just last week, gave birth at 19 weeks to twin baby boys and had to say goodbye as soon as she said hello. For our sweet church friend whose 18 yr old daughter died in a car accident last fall. For my own mom who still sorely misses her first-born son. He has been in Heaven for 8 yrs now. For multiple friends who are still longing for the joy of being a mother. I remember that pain. There was a Mother’s Day, 8 yrs ago, that I remember very well. I had just suffered a miscarriage at 13 weeks. I was angry at God and could not imagine why He would allow some women(who didn’t even want kids) to have one healthy pregnancy after another. Yet here we were, trying so desperately to have just one. That Mother’s Day hurt. I cried through the church service. Looking back, I can see how near God was… He was drawing us to Himself. We had things to learn through that season of tears. So today, all I can do is pray that God will be as near to my friends (and family) as He has been to me through heart-aches. Sometimes it is only after the ache has faded that we can see how near He really was. But my sincere prayer is that these women will feel His nearness today, no matter how sharp or dull the pain. It’s hard to believe I’m writing this from Colorado. It was impossible. Out of the question! But one week ago, the doctors said “you may get to go home if this keeps up.” We were shocked! The last ultrasound had shown nothing but good news. The amnio test proved that there was no leak. Contractions have slowed to only a few random ones per day. The doctors start the weekend telling us that the bleeding will probably continue until Will is born… because placentas don’t generally heal. But last Sunday, it stopped! And hasn’t started again. Yet another reality that was not supposed to be possible. On Wednesday morning, Dr. Clewell came in to our room and said “well? Any changes over the night?” to which I replied “nope!” He smiled and patted my leg. “Great. Let’s get you out of here! !” A few hours later, I was out! We spent the rest of Wed (May 9) at a hotel. The girls swam, we napped, ordered Chinese, and just LOVED being together. Sleeping in the same room (and bed) feels like a great privledge now. Thursday afternoon, my dad flew in to Phoenix, and then turned around and flew back out with me! The flight to Denver was uneventful, other than turbulence as we descended. That one bumpy moment was the one contraction I had all day. SO much better than I expected! My dad dropped me off with our good friend (and dentist) and his wife, then headed home to bed. Dr. Randy and Kathy Sanders took such great care of me all weekend! They ate every meal “picnic style” with me by my bed. I wish there was some way to express my gratitude for all they did! We are truly blessed to call them friends. After a restful weekend visiting with friends, Nathan and the girls arrived. They picked me up Sunday morning and we were able to go to church together (me in a wheelchair, them running circles around me)! Mother’s Day was spent with my babies. All 4 of them. Will made his presence known in the form of hiccups, punches and kicks. Mother’s Day marked 25 weeks and 2 days on the pregnancy calendar! I have SO many blessings to count this year. Thursday, May 3rd. The day we found out we were having a boy, I told Nathan “I want to use the name Asher.” He said “but we already picked William James!” I know. But I can’t get Asher out of my head. It means happy or blessed. I love it. Can’t we just squish it in? We say it aloud a few times “William Asher James.” Yep. I love it. I had no idea how prophetic the meaning would be to our baby boy. You know it’s going to be a good day if it starts out with one of your closest friends flying in from Michigan! Amanda had been planning her visit to CO this weekend. She was helping Kimberly (my little sister) with baby shower plans for Saturday, and we were hoping for lots of Starbucks and shopping time together. At least, that *was* the plan! Now we have a new plan. Chill in my hospital room. Paint our nails. Talk. The rest of the day, we wait. We talk, we get excited about the contractions continuing to space out, my parents keep the girls almost all day long. They all arrive after lunch in new matching dresses and hair all done with bows. I love seeing them walk in the door! The dr eventually decides that everything looks fine, and says we are going to do 2 things next. The first is an amniocentesis (drawing some amniotic fluid), to rule out infection. The second is injecting a bunch of bright blue dye into the amniotic fluid to see if it’s leaking out at all. They call it the smurf test. That’s how blue this stuff is!! As they proceed with the amniocentesis, they continue doing an ultrasound, so as to be careful to not poke William. It hurt worse than I expected, and the feeling of the fluid being pulled out is VERY weird. Will tries to grab the needle that is invading his space, and Dr.C attempts to wiggle it away from him. Silly, curious boy! Finally, it’s over. Fluid out, dye in, nothing but good news. They said that it appears to be just a slight abruption of the placenta, so we should just plan on it continuing to bleed until the baby is born. Bleeding aggravates everything though, so we will almost definitely still have a pre-term baby. It’s now Wednesday morning, 48 hrs from the beginning of this strange situation that is our new reality. Everything seems to be focused on the coming evening. That’s when the steroids will have taken their full effect on the baby’s lungs and given him a fighting chance of survival, should he make his appearance right now. That’s also when they are going to take me off the Magnesium IV! I asked about taking a shower again today, but they keep saying “let’s just see how you do today…” I am guessing that since they still won’t let me get out of the bed, I’m not doing as well as they would like. I am still on full-time contraction and baby-heartbeat monitors. But the contractions only come when I change position drastically or if I get worked up. As long as we avoid those two things, maybe we can keep them at bay. I’m still on 2 mg of Magnesium Sulfate. People keep bringing me things to eat, but chewing is almost impossible! My muscles feel so heavy and lazy… it’s weird. I had 3 bites of baked potato for dinner, which tasted SO good, but then I couldn’t get my jaw to open wide enough to get more bites in. Guess that meal is over! My parents brought me a chocolate malt from Sonic (God bless Sonic!!! Everything from there tastes amazing, and it’s right around the corner!!!) which may have been the happiest moment of my day. No, scratch that. The happiest moment was when my parents brought the girls by and they walked into the room saying “Hi Mommy!! !” Each taking turns to kiss me carefully. They ask if Baby William is doing better. OH how I miss holding them, putting them in bed, taking them to the potty, jumping up to kiss their owies, fixing their meals, cleaning up the spills, doing their hair, giving them baths… things that I usually complain about. God, thank you. I needed a perspective change. Clearly. I can not forget to mention one of the most amazing blessings thus far. Chelsey! She is a friend from Colorado who was our doula at Gabi’s birth. She is an angel. We recieved a call from her on Monday night (I think?) asking if she could come help with the girls. How to care for them through all of this was one of our greatest concerns, so of course we gratefully accepted!!! Our sweet Michelle picked Chelsey up at the airport this-morning. She has been here with us all day, since my parents have the girls and didn’t need backup. I can not begin to describe the relief I feel, knowing that someone is here to take care of my sweet girls. Indefinitely. Knowing that she will respect the boundries already in place, have tons of fun, make sure everyone is cared for, and do it all in her amazingly sweet way is just incredible. We are SO glad God sent her. I battle with mixed feelings all day over the issue of the Magnesium. While I am counting down the hrs until it runs out (it’s making my IV arm cramp and burn like I can’t believe), I am nervous. After all, it’s the mag that stopped the contractions. They were coming every 3 minutes. Part of me curses the horrible stuff and it’s unbelievable side-effects… at the same time I find myself thanking God for it. It really is a miracle drug. Labor would have kept on marching without it. Several times throughout the day, different nurses and drs stop in to check on us. I feel that they are preparing me for labor. They keep saying things like “now when they mag comes off, pay close attention to the contractions.” or “did we already have you sign the release for emergency cesarean?” One of the drs wanted to make sure that the girls were taken care of so that Nathan could be with me all night. At least two people told me that early water breakage and labor is generally from infection, which mag can only stop for a little while. I truly think they all believe we’ll be having a baby tonight. 7:45 pm, the nurse comes in and takes down the bag of Magnesium. OH happy day! Within 10 minutes I feel like a new person. I can suddenly focus my eyes. My headache begins to clear. The perpetual hot flash stops completely. Hooray!!! My hands are still VERY puffy, but I’m sure that will clear up soon. Over the next few hrs I am paying very close attention to the contractions…. but there is only 1! They are definitely not picking up. Yet. And to make things even sweeter, we are at the 48 hr mark now!!! What a comfort to know that we have this incredible technology available to us. Hours later, I’m able to sleep. Blissful of the fact that I have only had 1 contraction in 2 hrs. I feel human again with the mag working it’s way out of my system. Amazing how my falling asleep prayer has changed in 2 days from “God please just be merciful” to “God why are you so good to us? ?” We are blessed and cared for beyond comprehension. Tuesday am, May 1. I think I’ve done pretty well up until this point. I have been choked up many times, and shed a few tears at the ultrasound, but nothing uncontrollable. Nothing that I couldn’t catch my breath from. That’s about to change. As soon as I could make my eyes focus a little, I tried to inspect my abdomen. It looks like it’s still getting bigger! I can feel a difference in Will’s movement… it seems more fluid. More free. More spacious. I have had 3 babies already, so I am familiar with the sensation of having a baby dry in there. Movement feels labored and sluggish. I felt it yesterday for those morning hours after the rupture. What a relief to feel more full now! I reach for my phone and see 12 text messages waiting, but I can not get my eyes to focus on them! My nurse walks in, sees me trying to read with one eye open, and laughs. She offered to help, so I closed my eyes and let her read me the dozen texts from my precious friends and family who are all so concerned for us. There is one from my mom… she and Dad are bringing Starbucks. Another from my friend Kristie in CO who says that if we are here long term, she wants to come visit and help with the girls. 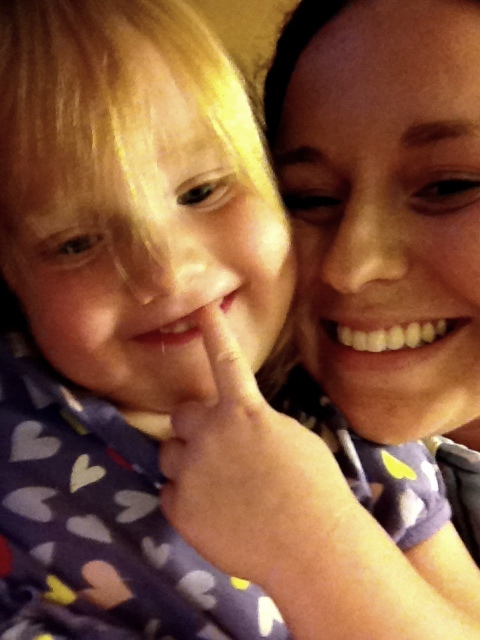 Several from my little sister… being so far away is so hard. I have a hard time responding to all the messages, but I feel so very loved and prayed for. My nurse says that the contractions have slowed to only about 3 per hr… it’s a good sign that I might be able to go off the mag soon. Thank you, God!!! The headache and lazy eyes and muscles and hot skin are incredibly frustrating. The nurse also says that since the neonatal specialists didn’t get much time with us yesterday, they want to come back today. That’s ok… I have a lot of questions that I hadn’t been able to form yesterday. My parents arrived with coffee (oh blessed Starbucks frappucino!) and take our little girls out for the day. They have plans for swimming and movies and all 3 girls are elated to see Mimi and Papa! Dr. Patel (another neonatal specialist) arrives and talks to us for what seemed like forever. He was very gentle, and very knowledgable, yet full of the same bad news. I was able to ask my questions about long-term staying. He said that as a general rule, no matter how early a baby is born, they are not ready to go home until their due-date… or close to it. His one encouraging bit was that Will is already measuring at 600 grams (1 lb, 6 oz), which is a bit large for his age. Large is good. Nathan and I look at eachother and a new reality begins to dawn. We are here for a while. A nurse chimes in that when you have a complete amnio rupture like I did, you can not leave the hospital. So we are here until Will comes, and possibly for a while after as he gets bigger. We’re talking the possibility of months in this hospital… at least until the beginning of August. The implications of that start running through my head. Where will Nathan and the girls stay? How will we ever pay for this? The girls can’t live in here for 3 months… they will go crazy. We don’t know anyone here. How on earth is this going to work? I keep telling myself to slow down and take one step at a time… but the questions will not stop. Dr. Patel runs through the list of complications. Again. The terrible odds. The cruelty of making a baby suffer unnecessarily. The unlikely chances of healthy childhood. 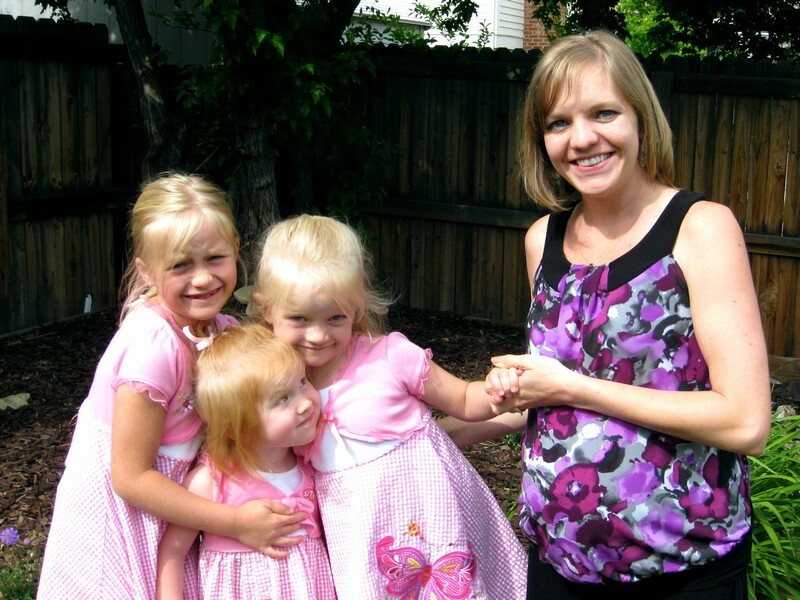 The implications of a damaged baby on a healthy family and three big sisters. Nathan and I look at eachother and agree…. again… this is our baby. Of course we don’t want to put him through unneccesary pain. But to start out, do whatever you have to do for him. At long last, the dr leaves. Michelle, Nathan, my sweet nurse (Christie) and I sit there in shock for a few minutes, trying to breathe through the heaviness in the room. Nathan tells me that our friend Chelsey, from CO, is wanting to come out here to help care for the girls. Indefinitely. Another friend of a friend here in AZ is offering to help with meals and childcare. A complete stranger has offered her guest room. God is providing above and beyond. I’m having a hard time processing everything, and feel so very tired. My nurse, Nathan, and Michelle all insist that I should try to nap while the girls are gone and things are quiet. That seems like a good idea, because I can barely see straight. But napping was futile… every attempt turned into a nightmare. Before long I could not stop the sobs and called Nathan back in. My nurse said I was having a nervous breakdown and called the pharmacy for some sort of med, but we managed to get a grip on it before they arrived. Nathan laid down and cried with me, prayed for us, and things somehow did not feel as dark. I don’t remember much after that melt-down. I know they moved us to another (way smaller) room. I know my parents took the girls back to their hotel for a sleep-over and Nathan stayed with me all night. The sleeping attempts were slightly more successful, though very interrupted by the monitors and beeping. In the end, I was just thankful to still be pregnant another day.